Female adult bees collect pollen from the lotus flower. Bee experts say that pollen are collected by females primarily to feed their larvae. That bees are dependent on pollen as a protein source and on flower nectar or oils as an energy source. 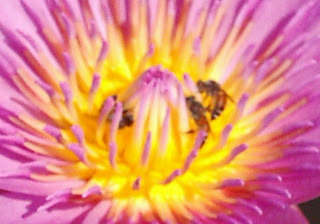 Photos of these bees were taken in a pond inside the Royal Palace front yard garden in Phnom Pehn.